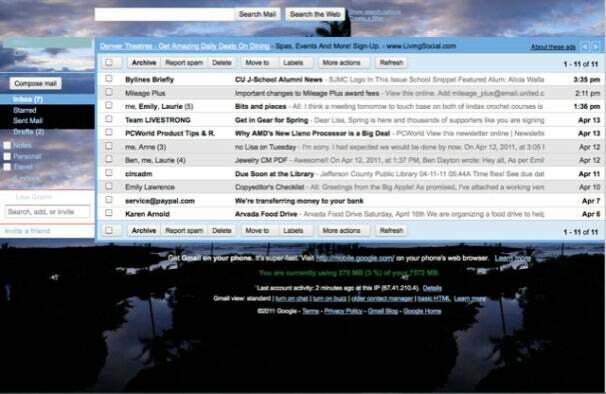 If none of Gmail's themes make you smile when you open your Inbox, starting today you can create your own. Using photos from your Picasa account, you can customize the look of the main area and footer of your Gmail pages. Custom colors have been possible for a while already. Choose "Mail Settings," then "Themes" and scroll down for the last option, "Create Your Own Theme." Follow the directions to choose a Picasa photo or upload something else, and customize text and background colors. Depending on the photo you choose, you may need to fiddle with text colors to make things legible. I chose a sunset photo taken from the lanai of a vacation house in Kapoho, Hawaii. It still needs work. Gmail does its own crop to fit the header and footer, so a landscape or still life will probably work better than snapshots, unless you like looking at the top of somebody's head, or select parts of your dog or child. If you can't decide, choose "Random" and rotate through all of Google's themes, plus your own. Our Daniel Ionescu reports today about another new pair of useful Gmail management features: "Don't Forget Bob," which prompts you to add somebody who belongs in a group, and "Got the Wrong Bob?" which might just keep you from confusing Bob your boss with Bob your ex, and other career-limiting moves.